On Friday I added support for yet another variant of DFU. This variant is called “driverless DFU” and is used only by BlueCore chips from Cambridge Silicon Radio (now owned by Qualcomm). The driverless just means that it’s DFU like, and routed over HID, but it’s otherwise an unremarkable protocol. CSR is a huge ODM that makes most of the Bluetooth audio chips in vendor hardware. The hardware vendor can enable or disable features on the CSR microcontroller depending on licensing options (for instance echo cancellation), and there’s even a little virtual machine to do simple vendor-specific things. All the CSR chips are updatable in-field, and most vendors issue updates to fix sound quality issues or to add support for new protocols or devices. The BlueCore CSR chips are used everywhere. If you have a “wireless” speaker or headphones that uses Bluetooth there is a high probability that it’s using a CSR chip inside. This makes the addition of CSR support into fwupd a big deal to access a lot of vendors. It’s a lot easier to say “just upload firmware” rather than “you have to write code” so I think it’s useful to have done this work. 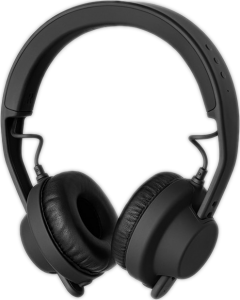 The vendor working with me on this feature has been the awesome AIAIAI who make some very nice modular headphones. A few minutes ago we uploaded the H05 v1.5 firmware to the LVFS testing stream and v1.6 will be coming soon with even more bug fixes. To update the AIAIAI H05 firmware you just need to connect the USB cable and press and hold the top and bottom buttons on the headband until the LED goes out. You can then update the firmware using fwupdmgr update or just using GNOME Software. The big caveat is that you have to be running fwupd >= 1.0.3 which isn’t scheduled to be released until after Christmas. If you know of any other “wireless speaker” companies that have issued at least one firmware update to users, please let me know in a comment here or in an email. I will follow up all suggestions and put the status on the Naughty&Nice vendorlist so please check that before suggesting a company. It would also be really useful to know the contact details (e.g. the web-form URL, or the email address) and also the model name of the device that might be updatable, although I’m happy to google myself if required. Thanks as always to Red Hat for allowing me to work on this stuff. Is this one worth investigating ? Added to https://fwupd.org/lvfs/vendorlist#ultimate_ears — I’ll update that page if I hear anything back. Oontz Angle 3 Ultra (bluetooth speaker). I have one of these. They provide a new firmware at https://theoontz.com/pages/optimizing-the-oontz-angle-3-ultra-for-audio-sync-with-video. It costs around 50 EUR including customs+shipping (via amazon.com). That device is interesting as I don’t actually think it’s a CSR device. It’s the first I’ve seen something else, and so it may well just be well camouflaged :) I’ve emailed the vendor just now, I’ll update https://fwupd.org/lvfs/vendorlist#cambridge_soundworks with any replies. Thanks. Great to hear! Im wondering how well these devices pair and work with the linux bluetooth stack, have you tested it? I tested it now and it works – except I dont think the aptX and aptX HD or other “hifi” bluetooth sound profiles are supported on Linux. The playback quality I get is very poor compared to my android phone. I haven’t tested firmware updating yet, but I assume that the CSR support hasnt landed to stable fwupd yet right? This is not related to wireless speakers, but seeing Focusrite on the Naughty & Nice list, I take it you try to support wired audio interfaces as well? Since Focusrite seems uncooperative, have you contacted Steinberg? They released the VST3 SDK under the GPL, so I’d figure they’re at least not totally against supporting Linux. Next Next post: Phoning home after updating firmware?